Opposition leader says Netanyahu should “initiate a comprehensive and courageous offer” to PA Chairman Mahmoud Abbas. 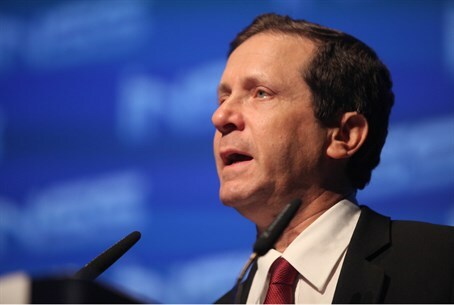 Opposition leader MK Yitzchak Herzog (Labor) on Saturday night launched a scathing attack on Prime Minister Binyamin Netanyahu and his coalition, blaming them for the collapse of the peace talks with the Palestinian Authority (PA). In a post on his Facebook page, Herzog called on Netanyahu to “initiate a comprehensive and courageous offer” to PA Chairman Mahmoud Abbas. "In recent days, I spoke with the Prime Minister, with Abbas, with [American mediator] Martin Indyk and others, and my impression is that the situation is volatile and very sensitive and we must not take irreversible and potentially harmful steps,” he wrote. Earlier, in an interview with Channel 2 News, Herzog condemned the unity pact between Hamas and Fatah which resulted in Israel suspending the peace talks with the PA.
Herzog said the pact was “an unnecessary and stupid move” by Abbas, but warned against Israel taking unilateral steps. According to Herzog, one of the main reasons for the failure of the talks is the lack of "a direct communication channel between Netanyahu and Abbas - there is no trust between them and they are now competing in the blame game." Also on Saturday, Science Minister Yaakov Peri (Yesh Atid) attacked Jewish Home ministers Naftali Bennett and Uri Ariel, blaming them for the failure of peace talks. The pact between Jewish Home and Yesh Atid, by which neither agreed to enter Prime Minister Binyamin Netanyahu's coalition government last year without the other, is over according to Peri. "In recent months there's a gaping chasm in national topics and topics of religion and state" between the two parties, remarked Peri. The Yesh Atid minister hinted at the possibility that his party would leave following the collapse of talks, saying sharply, “Neither Bennett nor Ariel - with all of their hallucinatory and sabotaging statements - will decide if we sit in the government." In response to Peri's comments, Jewish Home fired back only a short reply, saying "the left needs to keep self-restraint even in times of distress."